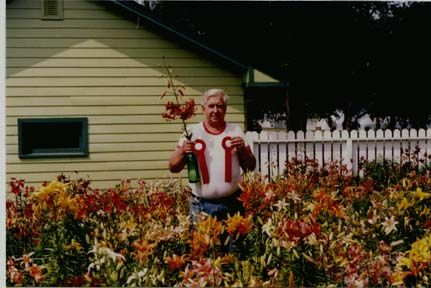 A photo taken after the 1990 Saskatoon Lily Show and printed in one of our past catalogs, shows gardener, Andy Dingwall's, "Best of Show" Asiatic Lily and his ribbon rosette for "Best Three Stems [of a cultivar] in the Show". Andy is surrounded by a sea of Asiatic lilies, grown without winter mulch, but are perfectly hardy in the Canadian Prairies. Have a question? Need help choosing varieties? E-mail is generally answered within 24 hours.